Urad dal vada recipe - Urad dal vada or vade is a speciality from South India, made with split black grams. 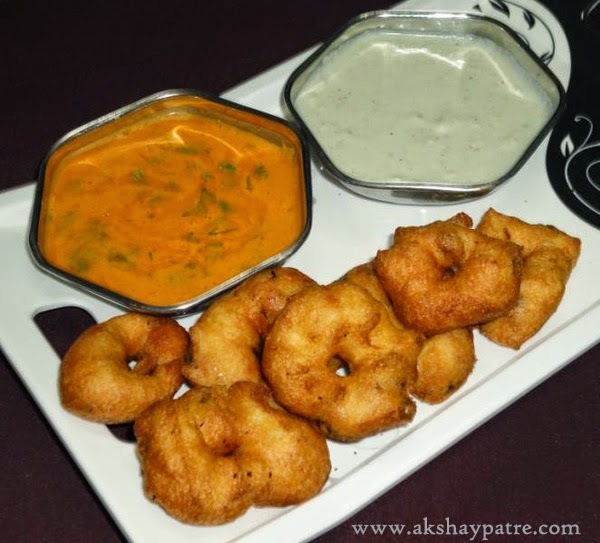 To prepare this vada, the soaked split black gram is ground to paste without adding much water to make a smooth and thick paste, then the other ingredients are added and deep fried to crisp. Usually this vada is served with coconut chutney and sambar. 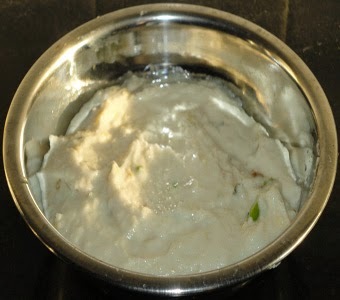 This is one of my favorite South Indian Snacks. While travelling to my home town, I taste urad dal vada in Belgaum where few good South Indian restaurants serve this fabulous snack. Comparatively, those vadas are large in size. I make small sized vadas just to save the oil wastage. I don't reuse the deep fried oil, so always use little oil by frying 2 -3 small vadas at a time. For giving beautiful round shape to the vada, you can use vada making mould which is available in the utensils shop. Soak the split black grams for 4-5 hours. 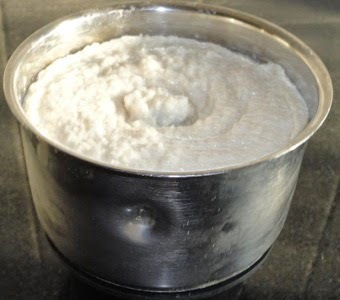 Drain the water and put half of the soaked urad dal in a mixer jar. Grind it with out water on a low speed to a smooth paste. Repeat the same process to other urad dal also. Transfer to a bowl and add all other ingredients. Mix well and set aside. Heat oil on a medium flame. Apply water to your palm and take one small portion of paste. Place it on the palm and pat it with another hand and make a small hole in the middle. Slowly drop it in the hot oil. Do not touch it till the bottom becomes slightly firm. Then fry on low flame by flipping till the vada becomes crispy and cooks well from inside. 1. Soak the split black grams for 4-5 hours. Drain the water and put half of the soaked urad dal in a mixer jar. 2. Grind it with out water on a low speed to a smooth paste. Repeat the same process to other urad dal also. 3. Transfer to a bowl and add all other ingredients. Mix well and set aside. 4. Heat oil on a medium flame. Apply water to your palm and take one small portion of paste. 5. Place it on the palm and pat it with another hand and make a small hole in the middle. 6. Slowly drop it in the hot oil. Do not touch it till the bottom becomes slightly firm. 7. Then fry on low flame by flipping till the vada becomes crispy and cooks well from inside. tempting vadas love to grab them.